I got my big 40th present a few months ago, but still loving the tallboy and the way it rides my local dry trails. Almost perfect conditions, with lack of nettles and brambles and with everything dry it’s running fast and fun. This week I took my standard local loop of about 18 miles, and put in a turn near the end to then ride it back home in reverse. Very pleased with the resulting 34 mile trail that makes the most of the local features. Good for endurance training. 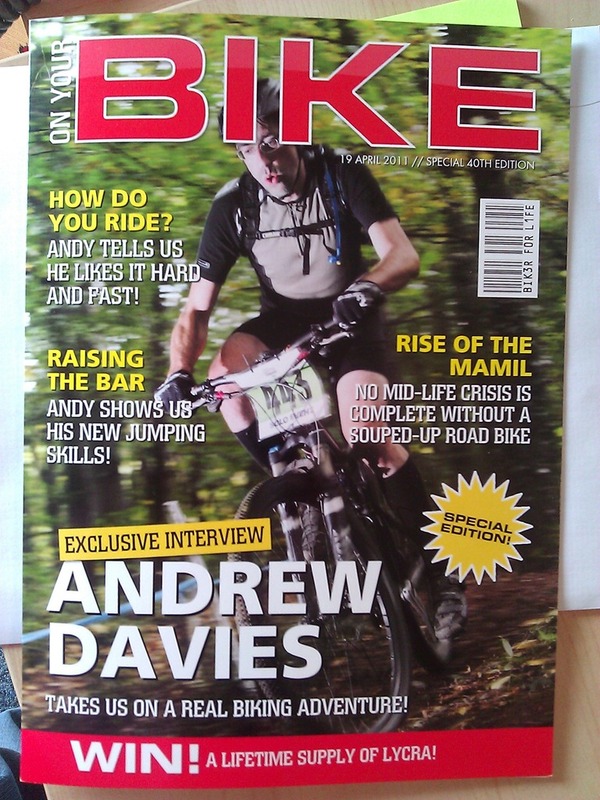 My birthday card from work made me laugh, with my very own magazine front cover. Got overtaken by a guy on a Boardman and on a mission, he was absolutely motoring, like it was a time trial or something. I match his speed for about 5 mins before HR went through the roof and happily let him go! Had someone slip-streaming me all the way from Keynsham, couldn’t shake him off but when I got him to take the lead he soon fell away. Nice to cycle with someone. Met a fellow villager on the last hill. Nice to chat on the last leg of the ride.